I had some leftover phyllo sheets in my freezer from this recipe that I tried last month, so I thought I’d build a recipe around phyllo dough. Then, AFAM-Peach was announced by Mansi and so I thought of doing something with peaches. Then I saw one of Giada’s recipes on the Food Network and suddenly everything came together. I finally had a recipe with peaches, phyllo cups and a couple of other ingredients thrown in to make this lip-smacking dessert that can be whipped up in no time. To make it even simpler, you could buy pre-made phyllo shells from the freezer section of your grocery store. The original recipe can be found here. This is my version after a couple of modifications and substitutions. Layer the phyllo sheets one on top of the other. Cut out 12 rounds (I used a knife and a katori) and press them into the mini muffin pan. Bake at 350 degrees F for 5-7 minutes until crisp. Remove from the oven and let it cool. Meanwhile, mix some mascarpone cheese and some raspberry yogurt in a bowl. Add the sliced peaches and mix gently. 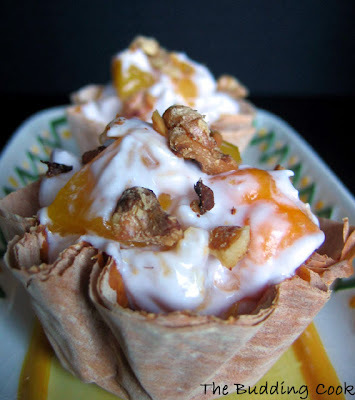 Spoon the mixture into the phyllo cups and top with toasted walnuts and serve immediately. While the phyllo cups are a nice addition and add a nice “crunch” to the dessert, I have also eaten it without the cups, and it’s just as delicious if not more. 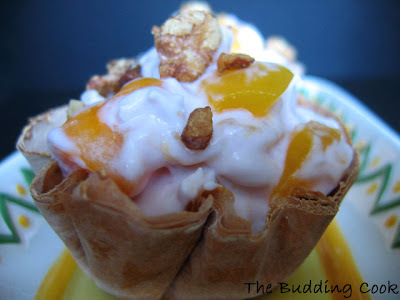 *Make sure you fill your phyllo cup with the dessert only when you are ready to eat it because the cups do tend to get soggy pretty quickly once filled. *Once prepared, the leftover cups can be stored in an airtight container for almost a week. *Though there is no real substitute for Mascarpone cheese, you could probably use a mixture of cream cheese and sour cream. When can i join you for some dessert :). Lovely idea to make phyllo cups, i have some sheets left from my spanakopita :-D.
Sounds different and unique entry for the Event...! That does look lip smacking indeed...beautiful dessert. THAT is a beautiful dish tbc.Looks gorgeous! Peach and Mascarpone cheese!! Slurp! Oooo! That looks so pretty! I've not tasted mascarpone. Seen it only in food network. This dessert looks ooey gooey good. I'm ready for dessert even before my breakfast. Could u pass it on please? Perfect Picture... Impeccable. I love Mascarpone cheese...and this dessert looks so delicious, I can have it any time of the day! i have everything except the phyllo sheets. this looks positively yum. ok seriously..i just read the title and thought TBC..Mascarpone (emphasis on the ponnne) and i knew it was Giada...and reading the write-up could not be prouder at my insight ;)...i have phyllo cups lying..now why did i not think about this!! Loved the recipe. Absolutely delicious pic. The mascarpone mustaches after the first bite...priceless. Looks cute TBC, love the combination of colours! I love it when the food looks fantastic besides tasting great - I can see these are a great example! OMG!! just with Mascarpone and peach I'd be thrilled, and to lure me more you added walnuts and raspberry yoghurt!! !...I'm salivating! thanks so much for this beautiful entry TBC!! I remember watching similar recipe sometime back in Food TV. Simple and delicious. Hey, this looks divine! Hum, why don`t you post your pasta recipe, I am sure you are a few hours behind us and the host`ll understand, she`s my friend. Now you got me curious with your recipe! Take care. TBC, I'm going to have to dub you "The Creative Cook." You make such marvelous little treats with phyllo cups. I remember how ga-ga I was over your baklava. This seems to be a happening place!! :-)Filled with pastries..desserts..vat not! I made the same thing with a lil twist inspired by Giada:) it makes a lovely dessert right? I made this long back in my blog called pinapple flower cups. ur version looks nice. Wowie.. this looks just too good. I can imagine how awesome this must've been even as I read the ingredient list... great and versatile idea. Thanks TBC. Please, may I have a cup? This is such a lovely dish, Beautiful beautiful presentation. Oh! mummy that looks sooooooo yummy. Love to have one right now. TBC, what a lovely dish . Pic looks beautiful too. Soo yummy! :) I wish I could get the recipe for making the phyllo dough at home! Those are like little delicious baskets. First of all thank you so much for the welcome note and stopping by. Wow!! this looks amazing!! Very interesting & mouthwatering looking picture.. Cant wait to lay my hands on one of these! This is one yummy dish! I just finished my sheets of phyllo recently! Excellent TBC, lovely pics as usual! so, are you from ekm ? or your parents settled there ? i'm from thrissur district, settled in ekm. great to find another malayalee food blog ! This looks so goos and what i liked more is its so simple. A big fan of Giada and I like ur twist a long. thanks for visitmg my blog. And do tell- wot is spanakopita? Kribha- same here.But it is a great thing to have on hand when you want to whip up some dessert quickly. Padma, Bee - thank you . Rajitha, ha ha...u crack me up everytime! Rina, TC, Seena, Namratha, Patricia, Pushpa, Mansi, Shivapriya- thanks for stopping by, girls, and for your words of encouragement. Now, if only I could write like you! Sharmi,I checked out ur version with pineapple. It looks absolutely gorgeous though it is different from Giada's version. Anh, welcome to my blog & thank you! Seema, welcome to my space:-)...and thanks for the compliment. Madhuli-you are welcome. I wonder when/if this will ever end. Priyanka- you could use whatever fruit you have on hand. Neelam-what did u make? Would like to see what you did with it. Renu- We're originally from central Kerala though we've only always lived outside of Kerala and visited during "vacations". It's only recently that my folks moved to EKM. Mocha- yeah, it is pretty simple ...and you don't even have t use/make the cups. It tastes just as great without 'em. Giada's awesome! This dessert looks wonderful, and it sounds simple to make! You did a beautiful job with it, though. I love Giada's recipes too.Thank you for the compliment. All the ingredients sounds greek and latin to me. Thanks for such unique ones. wow!what a great easy dessert!